When the latest news handouts from Devil’s Bowl Speedway came out this during 2012 many of the featured names were second or even third generation members of Northeastern racing families. With things changing so much for that track in the past two years, one of the only completely stable stories is this continuation of racing, through the generations, as is predominantly the case at most race tracks. The latest version of Devil’s Bowl is fresh and upgraded, thanks to the efforts of Mike and Alayne Bruno. But there are many connections to the earliest days of the track [see below]. The 2012 modified champion was, again, Ron Proctor from Charlton, New York, who is not only a second generation driver, himself, but he is father to one of the drivers finishing a few places below him in the standings. My first exposure to the racing Proctor family came at the old Fairmont Speedway, in Fair Haven [the forerunner of Devil’s Bowl]. In the 1963 season, a year that saw the last heyday of the flathead and six cylinder race cars in that area, the track was invaded one afternoon by a big, yellow Plymouth sedan numbered 52. The newcomer turned out to be one George Proctor, then from Crescent, NY. This caught my eye for two immediate reasons – I was from Proctor, Vermont [and one of the wealthy ruling family of the town was named George Proctor]; and I was already fully aware of the town of Crescent because of the legendary Pete Corey. Now, different versions of race coverage had Proctor living in Crescent, Waterford, and other locales; but Crescent was what was announced that afternoon. There was, at first, little fanfare for the plain – looking car which had been running at such places as Victoria Speedway, Dunnsville, NY; the Pine Bowl, Snyders Corners, NY, and maybe Whites Beach Speedway near Saratoga. of the second row in car 29. In August of 1963, Fairmont was holding the City of Rutland trophy race on a Sunday afternoon. Proctor proceeded to make a shambles of the rest of the field that afternoon. Ironically, he shares a last name [but no relation] with the wealthy family that founded Rutland, a long time before. He recently told me that he felt somewhat relieved that day after having been just about the opposite at the oddly – configured Pine Bowl track, just before. It was all a matter of gears, and none of the cars were using quick changes in those days, in our neck of the woods [especially with a budget like Proctor’s]. He was hell on wheels at Victoria in the hobby class, and that track was similar to Fairmont. So Ron Proctor comes by his accomplishments naturally. Father, George, has the distinction of being one of the biggest upset winners in the history of the storied Fonda Speedway. Ron had run for years, under – financed much like his father; and he had struggled mightily to compete at Albany _ Saratoga Speedway against some huge modified racing operations. 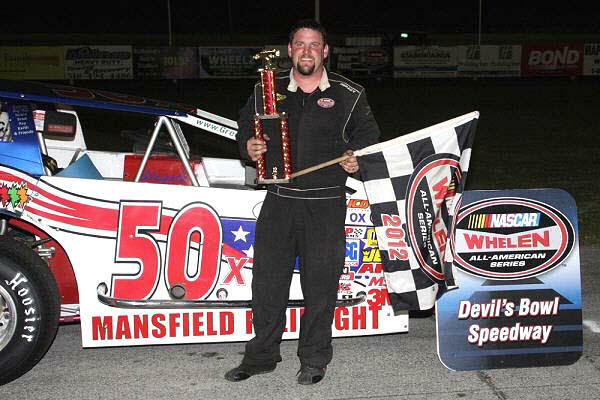 When he decided to support Devil’s Bowl, in its conversion over to asphalt in 2011, he finally found himself on more equal footing with the competition, where his skill and experience counted for more. Proctor [center] enjoys his second straight Devil’s Bowl championship. Ron’s son, Jamie, finished ninth in the Bowl points. 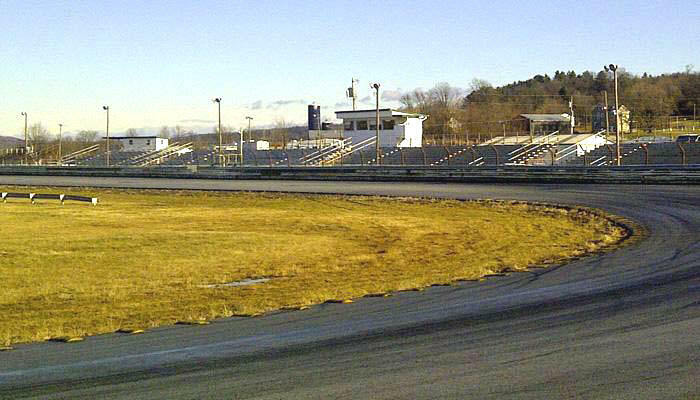 As a matter of fact, there was one particular evening at Plattsburgh’s Airborne Speedway [around 2009] when all three generations of the Proctors actually competed in the same program, at the same time. George, 71 years old at the time, kept right up with the rest of the field in what might have been the Proctors’ first time running their dirt cars on pavement. The generous NASCAR awards that Ron has received for his track championships have been a real shot in the arm for the still – underfinanced racing operation. This year, Proctor narrowly edged out Vince Quenneville, Jr. [winner of Vermont State Rookie of the Year] for the championship. While no fuzzy – cheeked twenty year [like much of his competition at the Bowl] this was Quenneville’s first full season on the asphalt Devil’s Bowl track he had slid around for years when it was clay. A shoestring operation much like Proctor’s, the Quenneville team survived a very damaging late season crash to chase Proctor across the line for the title. 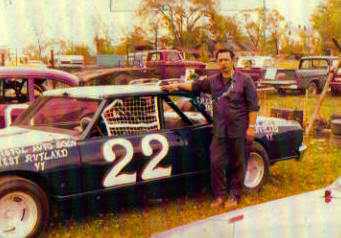 Vince, Sr. with arguably the best car he ever had – the Scarborough – built 1968 Devil’s Bowl championship car. lose to Proctor later that Autumn. Devil’s Bowl is synonymous with the name Quenneville. Vince Quenneville, Sr. was track champion at least once, and has a long list of feature wins to his credit. The hall – of – fame – caliber elder Quenneville usually had a more comparable racing budget – as compared to the competition – than his son has to work with. Vince, Sr. first arrived on the scene, for all intents and purposes, in 1961 when he ran a 1936 Chevy coupe for Norm Scarborough at the then – new Otter Creek Speedway near Vergennes. 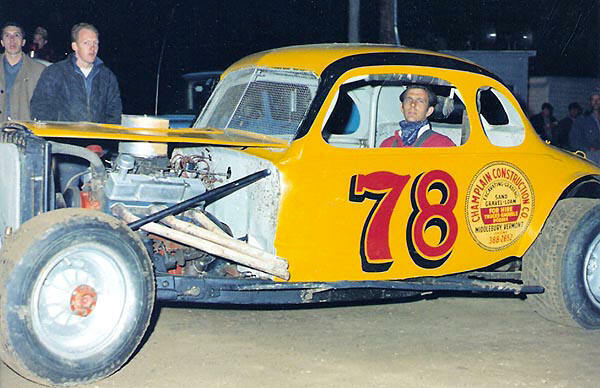 Arguably the best car owner Quenneville ever had, Scarborough fielded highly – competitive cars for Vince in two separate time periods, at Fairmont and Devil’s Bowl. 78 [Below] as champion [with its driver, Mert Hulbert]. 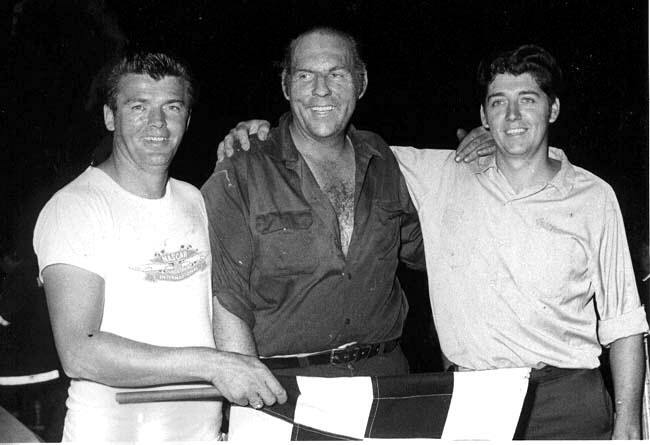 Vince, Sr. achieved legend status driving for Scarborough, Gael Dundon, Austin Dickerman, and Jack Ryan [to name a few] before his untimely death in a traffic mishap while he was still in his racing prime. Vince Quenneville, Jr., who bears a strong resemblance to mother, Barb, may well have titles at Devil’s Bowl or other tracks, but this information is not something I have available. He is certainly good enough. He actually outdid Proctor in feature wins in 2012. He has run for a long period of time for John Danyou, a second generation car owner out of Middlebury. enters the track at Catamount Stadium in the best Hurricane entry he ever ran. 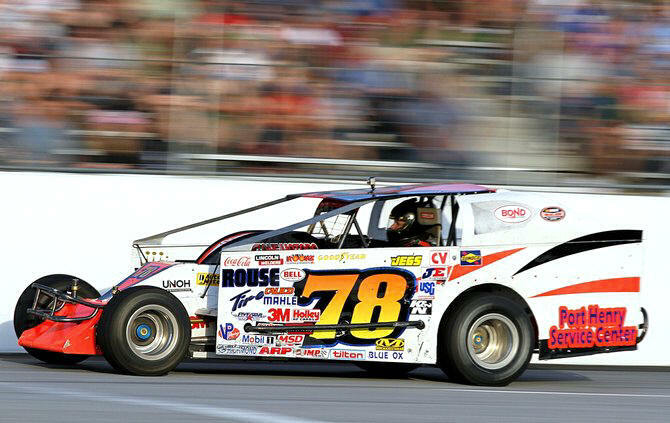 Before running the budget modified car in 2012, Roberts had run almost exclusively in Tiger Sportsman cars at Thunder Road and at Airborne. The son of the late hot shoe, Danny Benoit and the grandson of Charlie Benoit, Joey had a pedigree that gave him a leg up when he began racing. The 50X was very well – financed, as are all of the Leigh Sykes Vermont Life Safety cars in that stable. Managing to win a feature in what was a first season in relatively unfamiliar equipment, Roberts will likely be a huge force in 2013 if the team chooses to continue. 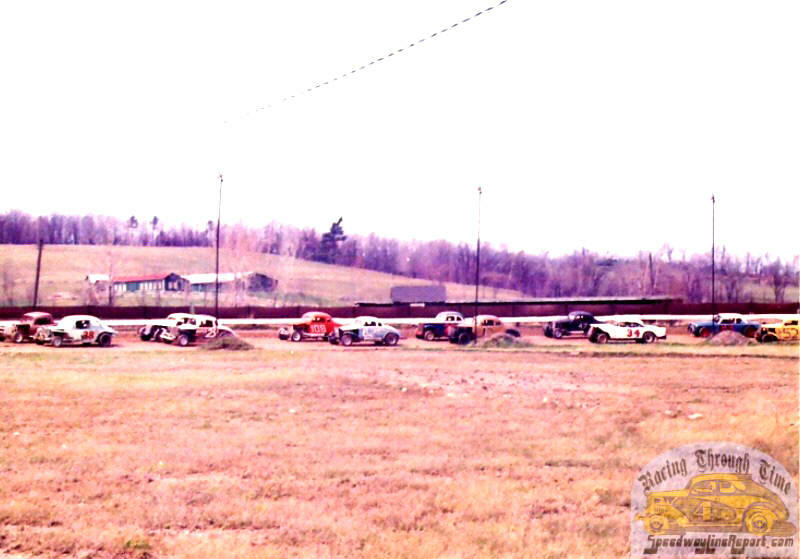 Charlie Benoit surfaced in the Hurricane Division at Catamount around 1971. Usually driving a large Buick car of one model or another, he quickly rose to prominence, running with considerably less money to spend than many of his competitors in that rapidly – evolving support class. Charlie eventually moved out of state, but apparently continued to race. His peripatetic son, Danny, began racing when I was not going to the races; but, I am told he was a very good driver – especially at Airborne and won at least one title. Another Benoit offspring, Codey Benoit, half brother of Joey, also has shown strong talent at a young age. A young Todd Stone with his first dirt late model, before he moved over to a brief but successful stint in the ACT late models. Below – Gardner Stone, teh in the Pro Stock class. Todd Stone, of Middlebury, a friend and employer of Quenneville’s, may have been the strongest competitor at Devil’s Bowl; but he did not run anywhere near a full schedule. Stone, son of still – active race driver Gardner Stone, took another track championship in 2012 - this time at Airborne. Stone has also run on the ACT late model tour, sometimes running against Devil’s Bowl promoter Mike Bruno [and the two raced many times in modifieds]. Hunter Bates, a recently – graduated Rutland High School student, ran in both the modified and late model classes at the Bowl in 2102. Bates not only happens to be from the Richards family that founded Devil’s Bowl, but I think his grandfather might have been Truman Bates, a Rutland area stock car driver who ran New Hampshire tracks in the 1950’s. Thunder Road star Ronnie Marvin and Canadian flagger, Paul Boyer. It would be a severe oversight and an ignoring of the obvious if we did not look to the current management of Devil's Bowl Speedway. Promoter Mike Bruno, himself a second generation driver on the West Haven track on both surfaces, probably got his devotion to the facility from his father, Johnny Bruno. Johnny, who had begun his time around the Richards' tracks with Bruno family wreckers, ended up entering a late model class car for himself in the track's history. Borrowing the number 222 from the Roger Gauthier - piloted midget owned by Poultney, Vermont's Dooger Jones, Johnny [and later brother, Ralph] was a strong runner in that class for years. Eventually, Johnny would tire of running the ungainly full - fendered support division cars. He would venture out to Canajoharie, NY and purchase a Champ Car chassis from Fonda Speedway legend Dave Lape. Bruno had reduced his number down a hundred to #22, and would paint the van - like body of that typical late 80's modified his familiar blue. Bruno had always kept a close relationship with Hydeville's fuel injection guru, Jim Hyde, who helped to give Bruno competitive power. Johnny's career [and life] was cut short when he was struck and killed while on a nighttime wrecker call in the area. Johnny Bruno, much like son, Mike, tried a little of everything in his short lifetime. Above left - his Devil's Bowl late model car. Above right - he briefly ran a pavement late model sportsman with the Northern NASCAR circuit. 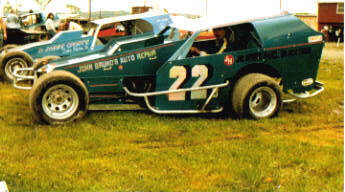 Below left - a later dirt late model. Below right - the Lape - built Champ Car. Combine this with the racing Intrones, James Sr. and Jr., from Granville, NY; second generation driver Matt White, who finished second in the late model points; the very young Joey LaQuerre III, whose grandfather, Joey, Sr. is still running late model sportsman cars for ACT; and Stephen Donahue of Graniteville – a Renegade class driver whose father, John is a leading ACT force and whose grandfather, Paul, ran in a number of divisions at T Road and Catamount. There are probably many more second or third generation drivers who hit the track at Devil’s Bowl Speedway in 2012, but I just don’t know them. This strong foundation will go a long way towards guaranteeing the Brunos future success with their speedway venture.